I have been reading a bit about Fondue lately and found some nifty fondue secrets. On Martha Stewart they mentioned that the wine adds acid that keeps things smooth – high acid wine even lemon juice can be added for more acid. They added garlic and nutmeg for flavour and they also added a tablespoon of corn starch. 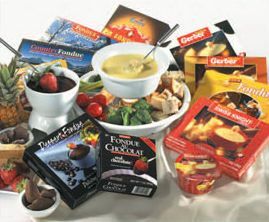 The traditional cheese for fondue is a Gruyere and Emmentaler mix in equal proportions. Both of these are available from a Swiss company called Emmi. These are pretty common, at Safeway, Whole Foods and even sometimes at Costco.